Last staged in the West End at the Lyric Theatre in 2005, The Night of the Iguana will return to London in 2019 with Clive Owen making a return to Theatreland. Following a reverend turned tour guide in 1940s Mexico, the play confronts topics of war, religion and ethics as a group of different-minded individuals have to come together in order to get through a torrential rainstorm. 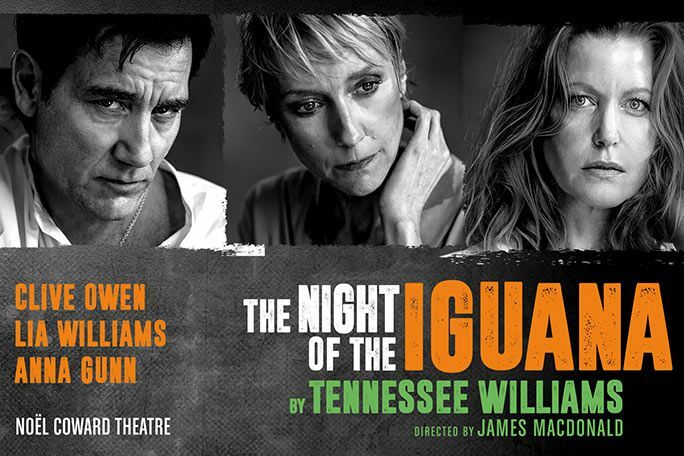 Directed by James Macdonald and featuring design from Oliver-Award winning Rae Smith, The Night of the Iguana will run at the Noel Coward Theatre for just 12 weeks. Clive Owen will return to the West End for the first time in 18 years to play Reverend T. Lawrence Shannon, last starring in Closer at the National Theatre. On Broadway, Owen has appeared in productions of Harold Pinter’s Old Times in 2015 and M. Butterfly in 2017. On the silver screen, Owen has been in many films including Croupier and Sin City, receiving worldwide praise for his performance in Closer in 2005, which saw him win 12 awards. Oliver Award-winning actor Julian Glover will star in the production, best known for his performance as Henry IV in the 1992 RSC production of the same name. Best known for playing Skyler White in the television series Breaking Bad opposite Bryan Cranston, Anna Gunn will make her West End debut in The Night of the Iguana. She made her Broadway debut in 1996 in The Rehearsal, but has more recently starred in the 2014 production ofSex with Strangers, directed by David Schwimmer. Lia Williams has appeared in West End plays since the 1990s, in particular originating the role of Carol in Oleanna by David Mamet Other stage credits include The Lady from the Sea, Absurd Person Singular and The Homecoming. Set in Mexico during the 1940s, audiences meet a broken down Reverend T. Lawrence Shannon, recently kicked out of the church for blaspheming against the image of God. Now a tour guide, the reverend meets an array of characters including the hotel manager, a group of German tourists who support Nazi ideals and an elderly grandfather as their opinions collide with each other, presenting a host of problems. LOOKING FOR CHEAP THE NIGHT OF THE IGUANA TICKETS AT THE NOEL COWARD THEATRE? With our huge range of cheap tickets for plays, London shows have never been better value. Book with us for The Night of the Iguana and enjoy great entertainment at a price that’s in tune with your budget. Where is The Night of the Iguana?